Sea snail with purple-colored secretions. Sailing along the coast of the Eastern Mediterranean Sea, an ancient seafarer might happen upon the rancid smell of rotting fish, a result of thousands of sea snails drying in the sun for the production of a precious commodity: the color purple. 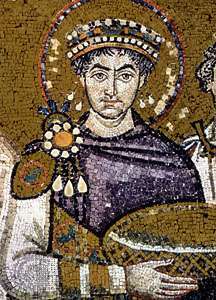 Mosaic depicting Emperor Justinian I in a purple robe, San Vitale, 547 AD. Possibly the most sought-after pigment of the ancient world, purple pigments had been created for dyeing cloth. Traces in pottery suggest that the color was utilized since the 18th century BCE, though it didn’t receive its name Tyrian Purple until around 1570 BCE. The pigment is named after the ancient Phoenician port city of Tyre, where a majority of the dye was produced. 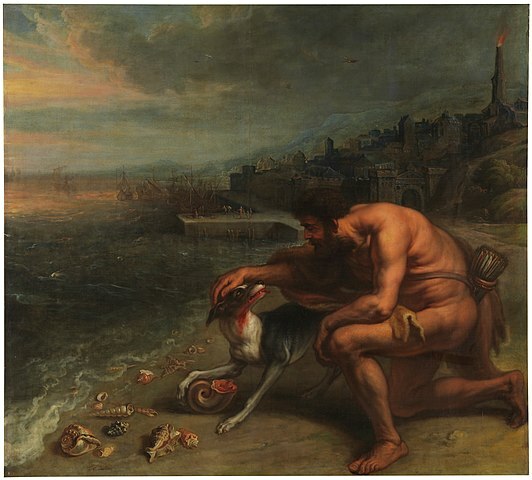 “The Discovery of Purple,” by Peter Paul Rubens, 1636. Leave them to steep for a period of three days, and no more, for the fresher they are, the greater virtue there is in the liquor. It is then set to boil in vessels of tin, and every hundred amphoræ ought to be boiled down to five hundred pounds of dye, by the application of a moderate heat… About the tenth day, generally, the whole contents of the cauldron are in a liquefied state, upon which a fleece, from which the grease has been cleansed, is plunged into it by way of making trial; but until such time as the color is found to satisfy the wishes of those preparing it, the liquor is still kept on the boil. The tint that inclines to red is looked upon as inferior to that which is of a blackish hue. The wool is left to lie in soak for five hours, and then, after carding it, it is thrown in again, until it has fully imbibed the color. Roman mosaic depicting a Murex shell, c. 1st century BCE. This long, grueling, and infamously smelly process resulted in very little product. It took approximately 12,000 snails to produce only 1.4 grams of pure dye, enough to dye the trim of a single garment. Little product did not equal little reward, however: the dye was worth at least, or perhaps even more than, its weight in gold. 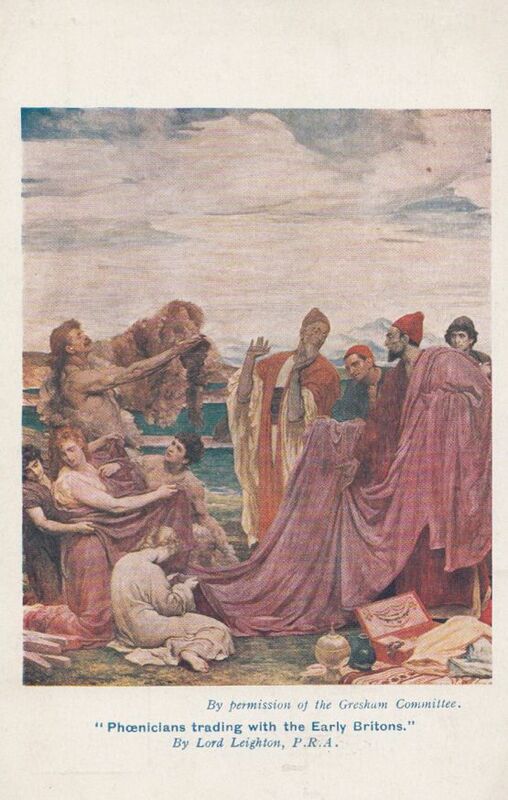 “Phoenicians Trading With Early Britons,” by Frederic Leighton, 1919. Not only was the pigment incredibly expensive, but it was also non-fading. In fact, the color became more vibrant over time, making it even more desirable in the ancient world. Soon, this precious commodity became a status symbol; only the highest-ranking people could be clad in the deep purple color. Burial shroud of Charlemagne with Tyrian Purple and gold, c.814 AD. The practice of creating the rich purple dye, once perfected, has been lost, and the population of sea snails needed for the dye has since diminished. However, while trying to find a cure for malaria in 1856, British chemist William Perkin serendipitously discovered a snail-free recipe to create a pigment similar to Tyrian Purple, now widely used throughout the world. He named his pigment mauve. Like Tyrian Purple, mauve is used to dye fabrics and is fade-resistant. In fact, it was the first synthetic dye to be discovered; before mauve, all fabric dyes were naturally derived from plants and animals. Perkin earned a small fortune for his discovery, and is still known today for his innovation in chemistry and fashion. 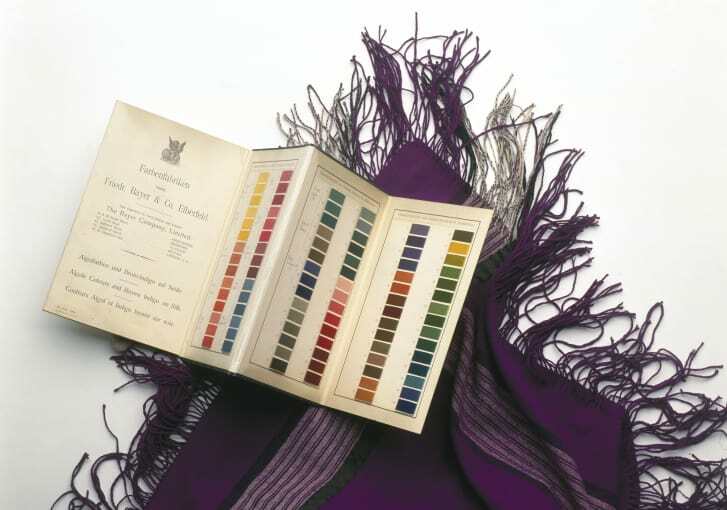 A shawl dyed with Perkins’ mauve.